D.-H. Kim, Z. Liu, Y.-S. Kim, J. Wu, J. Song, H.-S. Kim, Y. Huang, K.-C. Hwang, Y. Zhang and J.A. Rogers, “Optimized Structural Designs for Stretchable Silicon Integrated Circuits,” Small 5(24), 2841–2847 (2009). J. Xiao, S. Dunham, P. Liu, Y. Zhang, C. Kocabas, L. Moh, Y. Huang, K.-C. Hwang, C. Lu, W. Huang and J.A. Rogers, “Alignment Controlled Growth of Single-Walled Carbon Nanotubes on Quartz Substrates,” Nano Letters 9(12), 4311-4319 (2009). H.C. Ko, G. Shin, S. Wang, M.P. Stoykovich, J.W. Lee, D.-H. Kim, J.S. Ha, Y. Huang, K.-C. Hwang and J.A. Rogers, “Curvilinear Electronics Formed Using Silicon Membrane Circuits and Elastomeric Transfer Elements,” Small 5(23), 2703–2709 (2009). M.J. Kim, J. Yoon, S.-I. Park and J.A. Rogers, “Electrically Interconnected Assemblies of Microscale Device Components by Printing and Molding,” Applied Physics Letters 95, 214101 (2009). S. Unarunotai, Y. Murata, C.E. Chialvo, H.-S. Kim, S. MacLaren, N. Mason, I. Petrov and J.A. Rogers, “Transfer of Graphene Layers Grown on SiC Wafers to Other Substrates and Their Integration into Field Effect Transistors,” Applied Physics Letters 95, 202101 (2009). H.-S. Kim, S.M. Won, Y.-G. Ha, J.-H. Ahn, A. Facchetti, T.J. Marks and J.A. Rogers, “Self-assembled Nanodielectrics and Silicon Nanomembranes for Low Voltage, Flexible Transistors, and Logic Gates on Plastic Substrates,” Applied Physics Letters 95, 183504 (2009). S. Wang, J. Xiao, I. Jung, J. Song, H.C. Ko, M.P. Stoykovich, Y. Huang, K.-C. Hwang and J.A. Rogers, “Mechanics of Hemispherical Electronics,” Applied Physics Letters 95, 181912 (2009). L.M. Campos, T.T. Truong, D.E. Shim, M.D. Dimitriou, D. Shir, I. Meinel, J.A. Gerbec, H.T. Hahn, J.A. Rogers and C.J. Hawker, “Applications of Photocurable PMMS Thiol-Ene Stamps in Soft Lithography,” Chemistry of Materials 21, 5319–5326 (2009). S.Y. Ryu, J. Xiao, W.I. Park, K.S. Son, Y.Y. Huang, U. Paik and J.A. Rogers, “Lateral Buckling Mechanics in Silicon Nanowires on Elastomeric Substrates,” Nano Letters 9(9) 3214-3219 (2009). T.T. Truong, J. Maria, J. Yao, M.E. Stewart, T.-W. Lee, S.K. Gray, R.G. Nuzzo and J.A. Rogers, “Nanopost Plasmonic Crystals,” Nanotechnology 20 434011 (2009). D.-H. Kim, Y.-S. Kim, J. Wu, Z. Liu, J. Song, H.-S. Kim, Y.Y. Huang, K.-C. Hwang and J.A. 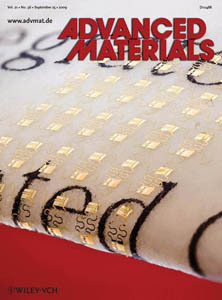 Rogers, “Ultrathin Silicon Circuits With Strain-Isolation Layers and Mesh Layouts for High-Performance Electronics on Fabric, Vinyl, Leather, and Paper,” Advanced Materials 21, 3703–3707 (2009). D.-H. Kim, Y.-S. Kim, J. Amsden, B. Panilaitis, D.L. Kaplan, F.G. Omenetto, M.R. Zakin and J.A. Rogers, “Silicon Electronics on Silk as a Path to Bioresorbable, Implantable Devices,” Applied Physics Letters 95, 133701 (2009). J. Xiao, A. Carlson, Z.J. Liu, Y. Huang and J.A. Rogers, “Analytical and Experimental Studies of the Mechanics of Deformation in a Solid With a Wavy Surface Profile,” Journal of Applied Mechanics 77, 011003-1 – 6, (2010). S.-I. Park, Y. Xiong, R.-H. Kim, P. Elvikis, M. Meitl, D.-H. Kim, J. Wu, J. Yoon, C.-J. Yu, Z. Liu, Y. Huang, K.-C. Hwang, P. Ferreira, X. Li, K. Choquette and J.A. Rogers, “Printed Assemblies of Inorganic Light-Emitting Diodes for Deformable and Semitransparent Displays,” Science 325, 977-981 (2009). J. Song, H. Jiang, Y. Huang and J.A. Rogers, “Mechanics of Stretchable Inorganic Electronic Materials,” Journal of Vacuum Science and Technology A, 27(5) 1107-1125 (2009). M.E. Stewart, J. Yao, J. Maria, S.K. Gray, J.A. Rogers and R.G. Nuzzo, “Multispectral Thin Film Biosensing and Quantitative Imaging Using 3D Plasmonic Crystals,” Analytical Chemistry 81(15), 5980-5989 (2009). J.A. Rogers and Y. Huang, “A Curvy, Stretchy Future for Electronics,” Proceedings of the National Academy of Sciences USA 106, 10875-10876 (2009). J. Song, Y. Huang, J. Xiao, S. Wang, K.C. Hwang, H.C. Ko, D.H. Kim, M.P. Stoykovich, and J.A. Rogers, “Mechanics of Non-coplanar Mesh Design for Stretchable Electronic Circuits,” Journal of Applied Physics 105, 123516 (2009). A.J. Baca, T.T. Truong, L.R. Cambrea, J.M. Montgomery, S.K. Gray, D. Abdula, T.R. Banks, J. Yao, R.G. Nuzzo and J.A. Rogers, “Molded Plasmonic Crystals for Detecting and Spatially Imaging Surface Bound Species by Surface-Enhanced Raman Scattering,” Applied Physics Letters 94, 243109 (2009). J. Maria, T.T. Truong, J. Yao, T.-W. Lee, R.G. Nuzzo, S. Leyffer, S.K. Gray and J.A. Rogers, “Optimization of 3D Plasmonic Crystal Structures for Refractive Index Sensing,” Journal of Physical Chemistry C 113, 10493–10499 (2009). J.A. Rogers, "Fireworks for Information Age," Proceedings of the National Academy of Sciences USA 106, 9127-9128 (2009). C. Kocabas, S. Dunham, Q. Cao, K. Cimino, X. Ho, H.-S. Kim, D. Dawson, J. Payne, M. Stuenkel, H. Zhang, T. Banks, M. Feng, S.V. Rotkin and J.A. Rogers, “High-Frequency Performance of Submicrometer Transistors That Use Aligned Arrays of Single-Walled Carbon Nanotubes,” Nano Lett 9(5), 1937-1943 (2009). D.H. Kim and J.A. 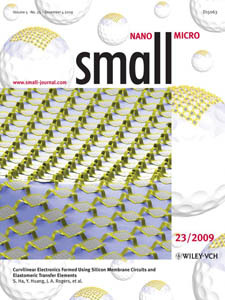 Rogers, “Bend, Buckle and Fold: Mechanical Engineering with Nanomembranes,” ACS Nano 3(3), 498-501 (2009). B.Y. Ahn, E.B. Duoss, M.J. Motala, X. Guo, S.-I. Park, Y. Xiong, J. Yoon, R.G. Nuzzo, J.A. Rogers and Jennifer A. Lewis, “Omnidirectional Printing of Flexible, Stretchable, and Spanning Silver Microelectrodes,” Science 323, 1590-1593 (2009). T.-H. Kim, A. Carlson, J.-H. Ahn, S.M. Won, S. Wang, Y. Huang and J.A. Rogers, “Kinetically Controlled, Adhesiveless Transfer Printing Using Microstructured Stamps,” Applied Physics Letters 94, 113502 (2009). D.K. Yi, J.-H. Lee, J.A. Rogers and U. Paik, “Two-Dimensional Nanohybridization of Gold Nanorods and Polystyrene Colloids,” Applied Physics Letters 94, 084104 (2009). E. Cubukcu, F. Degirmenci, C. Kocabas, M.A. Zimmler, J.A. Rogers and F. Capasso, “Aligned Carbon Nanotubes as Polarization-Sensitive, Molecular Near-Field Detectors,” Proceedings of the National Academy of Sciences USA 106(8), 2495–2499 (2009). N. Pimparkar, Q.Cao, J.A. Rogers and M.A. Alam, “Theory and Practice of “Striping” for Improved ON/OFF Ratio in Carbon Nanonet Thin Film Transistors,” Nano Research 2, 167-175 (2009). J.N. Tey, I.P.M. Wijaya, Z. Wang, W.H. Goh, A. Palaniappan, S.G. Mhaisalkar, I. Rodriguez, S. Dunham and J.A. 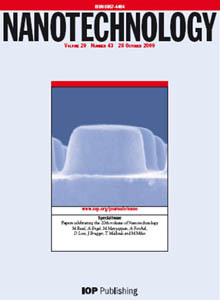 Rogers, “Laminated, Microfluidic-Integrated Carbon Nanotube Based Biosensors,” Applied Physics Letters 94, 013107 (2009). M.C. George, E.C. Nelson, J.A. Rogers, and P.V. Braun, “Direct Fabrication of 3D Periodic Inorganic Microstructures Using Conformal Phase Masks,” Angewandte Chemie International Edition 48, 144–148 (2009). D. Shir, E.C. Nelson, Y.C. Chen, A. Brzezinski, H. Liao, P.V. Braun, P. Wiltzius, K.H.A. Bogart and J.A. 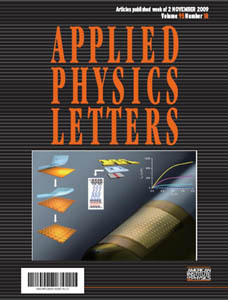 Rogers, “Three Dimensional Silicon Photonic Crystals Fabricated by Two Photon Phase Mask Lithography,” Applied Physics Letters 94, 011101 (2009).